This paper contributes to the ongoing debate to which extent climate and climatic change have a negative impact on societies by triggering migration, or even represent underlying causes for conflicts. It presents results from an in-depths analysis of the connection between climatic and selected socio-economic parameters and the major migration waves from Southwest Germany into North America during the 19th century. The aim was to assess to what extent climatic conditions triggered these waves of migration. The observed century was in general characterized by the Little Ice Age Climate with three distinct cooling periods, causing major glacier advances in the alpine regions and quite a number of climatic extremes such as major floods, droughts and chilly winter times. Also, societal changes were tremendous, marked by the wartimes during the Napoleonic era (until 1815), the abolition of serfdom (1817), the bourgeois revolution from 1847/48, economic freedom (1862), the beginning of the industrialization process accompanied by large-scale rural-urban migration, resulting in urban poverty, and finally by the foundation of the German Reich in 1870. The presented study is based on a quantitative data and qualitative information based discourse analysis. It reflects climatic conditions as well as socio-economic and political issues, which lead to the hypothesis of a chain of effects, consisting of unfavorable climatic conditions – decrease of crop yields – rising cereal prices – emigration. For the identified emigration peak years of each wave of migration, the connections between emigration and the underlying climatic conditions, crop yields and cereal prices were statistically evaluated by a sequence of linear models which proved to be significant with explanatory power between 22 % and 38 %. Kälte und Missernten haben natürlich einen Einfluss auf die Auswanderung gehabt. Die Autoren fanden einen Anteil von 22-38% in Bezug auf die Auswanderungswellen. Natürlich ist das Ganze noch deutlich vielschichtiger, wenn man die politischen Turbulenzen des 19. Jahrhunderts miteinbezieht. 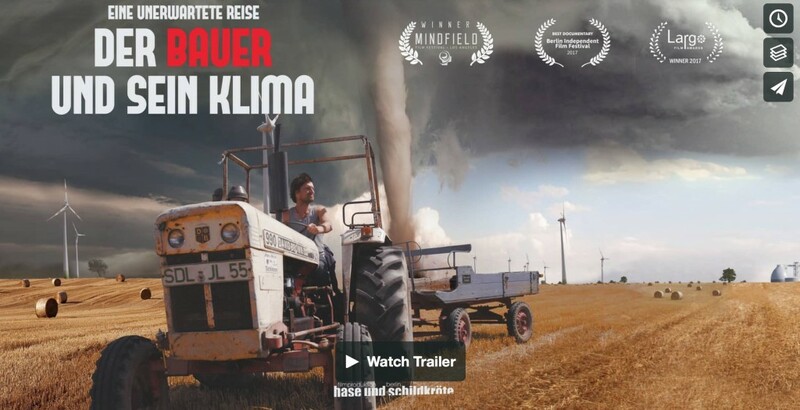 Ein Film über Landwirtschaft, Klimawandel und Energiewende. Er beginnt seine eigene linke Ideologie zu hinterfragen… Machen wir das Richtige? Zum Trailer und Film geht es hier. Siehe auch unsere Filmrezension “PIK verweigert Filmemacher Interview: Die Unsicherheit wächst“.